The city of San Diego will receive $14.1 million for homeless services as part of a new state grant program, Mayor Kevin Faulconer announced in a Tweet on Monday. The city’s share is part of $500 million in grants Gov. Jerry Brown agreed to put in the budget as the Homeless Emergency Aid Program, or HEAP. In a Sept. 13 memo to the City Council, Faulconer wrote that an application from his office sought $4.5 million in rental assistance and subsidies, $4.5 million in homeless services, $2 million in capital improvements, $700,000 to help homeless youth and $2.4 million for other projects for a total of $14.1 million. The HEAP grant was discussed at a City Council meeting last month as a way to fund 50 more beds to be added to the 200-bed bridge shelter tent operated by Veterans Village of San Diego, one of three bridge shelters operated by the city. Council members at the September meeting agreed to spend an additional $1 million to make staffing changes at the three tented shelters, but didn’t commit to using HEAP money for the Veterans Village shelter. Besides the $14.1 million coming to the city, the San Diego Regional Task Force on the Homeless is eligible to receive $18.8 million in HEAP grants, said Russ Heimerich, deputy secretary of communications for the state Business, Consumer Services and Housing Agency, which oversees the program. Of that money, $941,000 would be set aside for youth homeless programs, he said. Funding eligibility is based on the percentage of the state’s homeless in any city and the number of homeless people found in the 2017 point-in-time count, Heimerich said. San Diego has about 6.82 percent of the state’s homeless population. In the first round of grants announced Monday, Los Angeles received $85 million, Oakland received $8.7 million and Long Beach received $2.9 million. In another category, the Bakersfield/Kern County continuum of care received $2.6 million. A continuum of care represents regions and multiple agencies that receive funding from the U.S. Department of Housing and Urban Development. The Homeless Emergency Aid Program originally was proposed as a $1.5 billion fund that would have been created by Assembly Bill 3171, which called for setting aside 25 percent of the state’s $6.1 billion budget surpluse for homeless programs. The bill was authored by Assemblyman Phil Ting, a Democrat from San Francisco. Nannette Miranda, communications director in Ting’s office, said the bill was dropped after the governor agreed to put $500 million into the state budget to create the HEAP grant program. 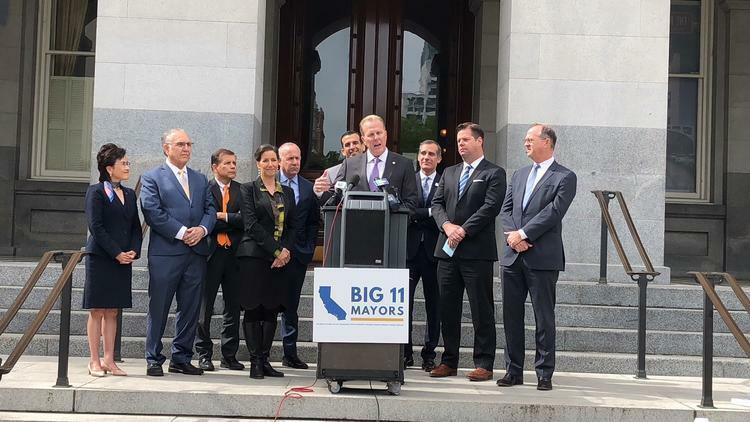 Faulconer and mayors from the state’s other 10 largest cities had united in a news conference in Sacramento earlier this year to urge for the passage of AB 3171.